Now here’s an amazing picture from the Alf Engen Museum, Park City, UT. What are we looking at? What’s the place? And, more importantly, who took the picture? No, not Ansel Adams, but close. 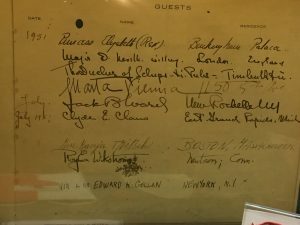 Yes, indeed, the Very Special Guest was Princess Elizabeth who visited the Mittersill Alpine Resort near Cannon Mt., NH, in 1951, probably in connection with her trip to Canada that year. Why would the future Queen of the Realm stay at a then-remote ski resort in Northern New Hampshire? We infer that she was visiting a member of the Hapsburg royal family, Mittersill’s founder Baron Hubert von Pantz, a wealthy Austrian sportsman and hotelier. His Tyrolean-themed Mittersill Club in Austria—a mecca for royalty from all over Europe—came to a sudden end in 1938 when the Nazis invaded. 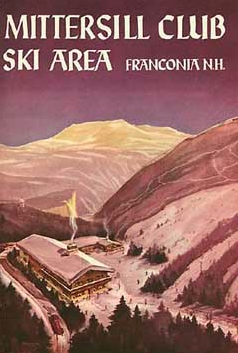 He resettled in New Hampshire and in 1945 opened the Mittersill Alpine Resort, which consisted of an Inn and number of unique, mountain-themed cottages, reflecting the Austrian style. 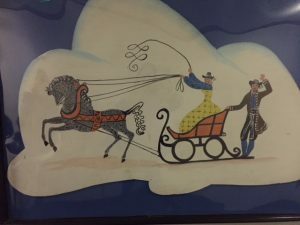 We visited the Mittersill Alpine Resort last February, checked out some of the original chalets, and found a collection of unusual illustrations posted on the walls of the Inn. 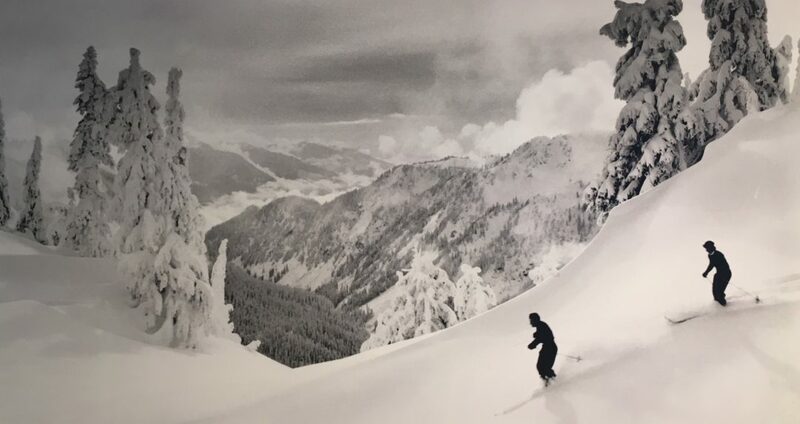 These charming pictures reflect another time, a Tyrol where horses and sleighs carried sports people dressed in “ski costume” around the mountains. We asked the Inn’s staff what the history of these magnificent pictures was but no one knew. We strongly suspect the Baron brought them with him from his club in Austria. And here’s a poster from the Mittersill Mountain Club’s early days. Cozy, eh? I don’t think so. i live in Alta, and this scene doesn’t look familiar–I can’t recognize it.